With the lunar and solar eclipses of August we have some powerful cosmic energy influencing our worlds. Let’s see what the Goddess has to say for how we might navigate the next cycle with ease and grace. I pulled five cards to give insight into working with the energies coming in for ease and grace. The 2 of Earth – Cycles represents who we are now as we enter August. We are moving through another cycle, coming through another time of transition. 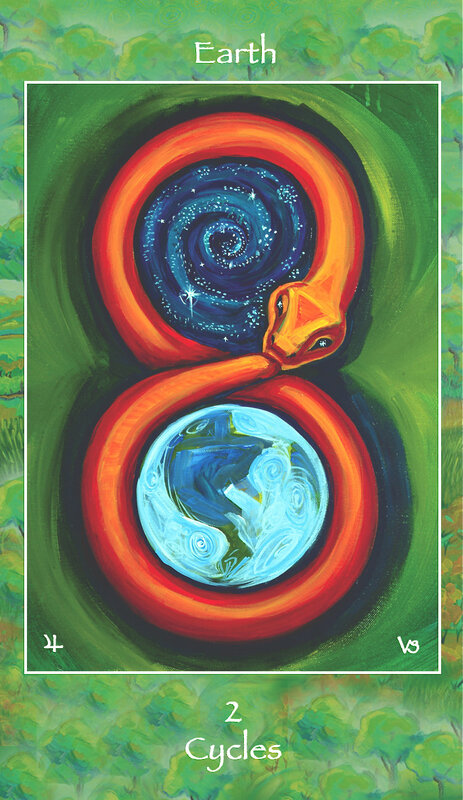 This card encourages us to take things in stride and go with the flow. All is in order in the Cosmos and in the ever changing structure of our lives. We are put on notice to let go of anything that needs to stay in the past, so we are unfettered as we move into a new month, a new cycle and new possibilities. In the Big Picture we have Pele, the Hawaiian Goddess of Volcanoes and Lightening showing us how everything is being purified. Things are coming apart, so we may be cleansed and cleared of that which is not respect and honor of the Divine within and without. Pepe’s power of fire is here to burn away the old, decayed, difficult energies that lack harmony and respect. Expect some things to fall apart this month. Don’t be afraid. This is exactly what is needed for new life and harmony to be restored. 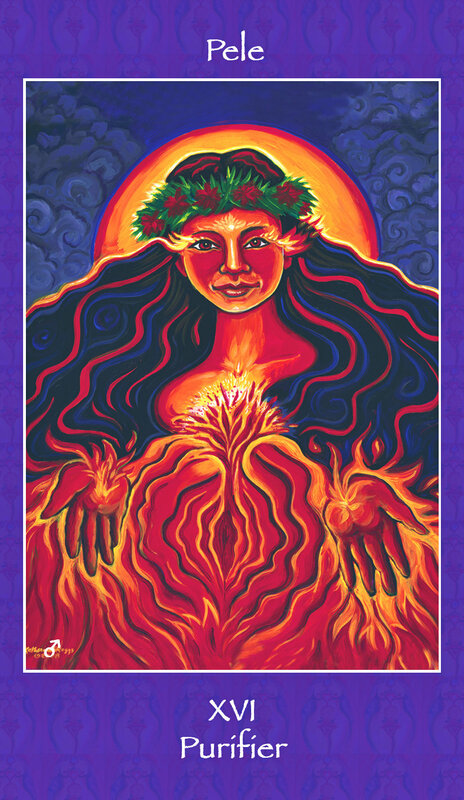 Go with this fiery release so the new cycles can restore us. Our greatest challenge and lesson during this time of great challenge and change, is to laugh at the shadows and darkness being expressed in our world, and in our selves. 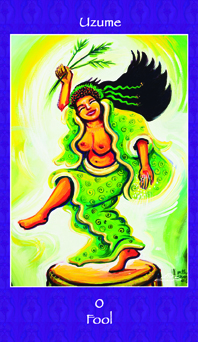 Uzume as the Fool is the perfect Goddess to remind us to stay light hearted as things fall apart. Don’t be afraid or in fear. Don’t get too serious about all of this. This world is full of illusion. Cultivate your ability to laugh and lighten up. It is time to dance in joyful abandon, laugh at the shadows and embrace the sacred crown medicine of the fool. She assures us we are protected as we stay in the energies of the light. The 7 of Fire – Courage is the perfect action for each of us to take now. 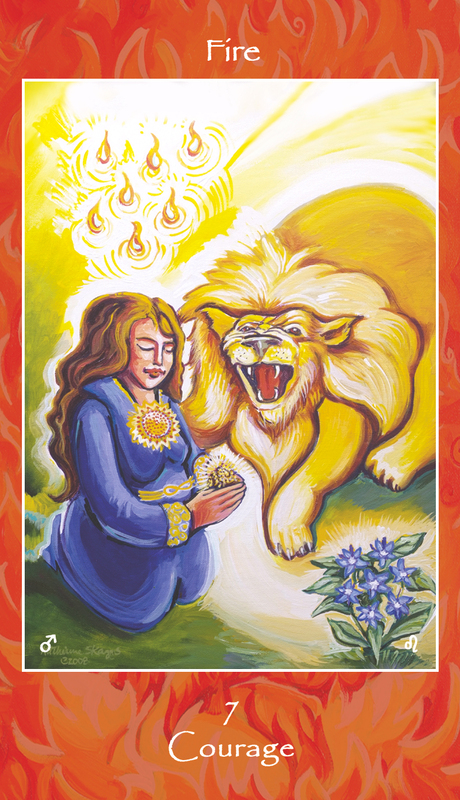 This beautiful maiden is full of light and love as she offers a fierce lion (how perfect since we are in the Leo energies this month) some food. She is the light hearted, loving being who isn’t afraid of anything. Her heart lights the way for peace and for unity. If you need some courage this month try some Sunflower or Borage Flower Essences to soothe your nervous system and to bolster your courageous heart. 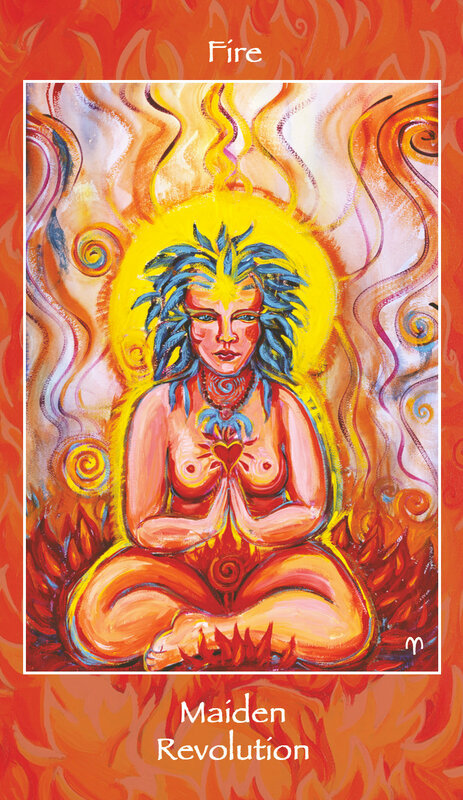 The Maiden of Fire – Revolution is our reward as we courageously, light heartedly move through the eclipse energies of August. Be assured of a revolutionary experience this month. Make sure to follow the action of courage and the lesson to stay light in your journey for an awakening of your soul. We are certainly in a revolutionary time. Trust in the expansion of your very soul as you release fear and move more clearly into the light within yourself, so you may bring that clearly into the world.